Trophy Leagues are groups where players are placed when they attack. You will be placed in the league that matches the amount of trophies that you currently have. Each trophy league level has it’s own award bonus if you win a match. You will join a league automatically when you attack another player, at the end of the first attack you will be placed in the appropriate league. You promote to a higher league if you met a certain trophy limit. You will demote to a lower level if you go under a certain limit. You get a league badge next to your name. You will get an attack bonus for every won attack. (1,2 or 3 stars). This bonus is added to your current raided resources! You can climb up on the league ladder and/or see what you other league members do. Each league does house 100 players. You will see the number of places moved up or down in your league. Each league lasts for 2 weeks. After a league is finished you will be placed in a new one. League seasons last two weeks, and they reset every other Monday at Midnight Eastern Time (US). You can check to see how much longer the current league season will last by clicking on the trophy icon at the top left of the main screen. The remaining time will be shown below your league level. When entered in the Legend league, each league lasts one month. 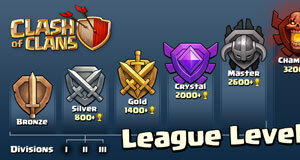 At the end of a Legend League season, all players in the Legend League will have their trophies reduced to 5000, however they acquire prestigious Legend Trophies to make up for the Trophies that they lose – purple Trophies that will be permanent in their profile. For example, if at the end of a Legend League season, a player finishes with 5100 trophies, they get reset back to 5000 trophies and earn 100 Legend Trophies. Next: The Gem Box is back!